276 – 2 Ivy Cottage. Occupier John Brown. Owner S S Ponton, Bank House Silloth. Kitchen, bk kitchen with boiler. Yard, CH & EC, 2 bedrooms. Stone built slated fair. Let @ 2/- weekly clear. 341 -1 Ivy Cottage. Occupier Kate Tiffen. Owner Mary Mitchell, The Knowe, Brayton. Parlour, kitchen, pantry, 2 bedrooms. Washhouse & EC, CH garden at front. Stone built slated stuccoed fairly good. Let @ 3/6 per week & rates. Freehold. 342 – Shop & workroom over. Occupier James Brown. Owner Mary Mitchell, The Knowe, Brayton. Stone built slated fair. Let @ £5.4 pa & rates. Life interest only. Freehold. 384 – School & school house. Cumberland CC. Mixed & infants. Assembly Hall. Large classroom. Partitioned Infants Room. Plastered walls & ceilings, plain windows. Lamplighted, hot water heated, distempered walls. Wood dado, 2 cloak rooms with lavs. 3 playgrounds. 6 ECs. Boiler house. School house front garden, parlour, kitchen, pantry, scull with boiler. Yard. EC. 3 bedrooms. All stone slated. There is a building on the school site at the eastern edge of the boundary. The main building fronting onto the road, and the schoolhouse, both appear on the 1901 OS map. 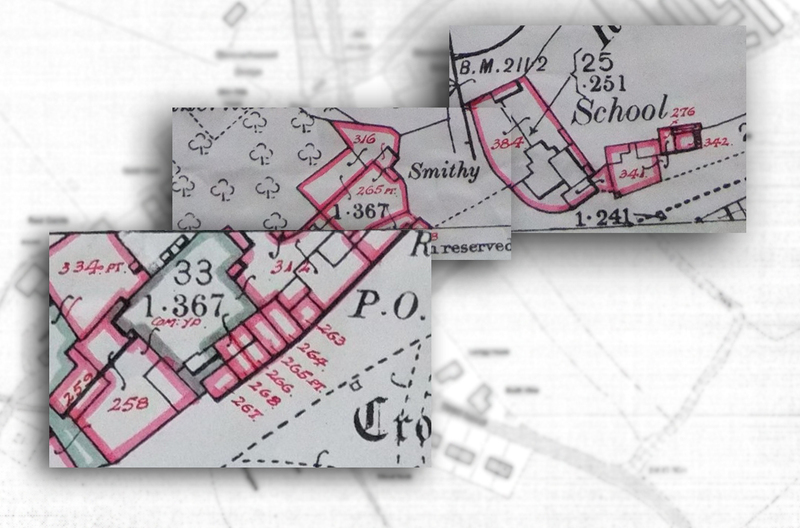 Buildings were on the site of Nos 1 and 2 Ivy Cottages and the Shop (numbered 276, 341 and 342 on the map) by 1865. These were remodelled or rebuilt and also renamed Linden Cottage and Ellenholm at various stages between 1900 and 2000. 1 to 3 Ellenbank Bungalows, between Ellenholme and Ivy Cottage, built in 20th century. There was a building on the site in the 1920’s but its current form had been achieved by the 1960’s. 316 – Blennerhasset. Smithy & blacksmith’s shop. Occupier Thos Graham. Owner Jas Thomson for Sir W Lawson. Smithy. Shoeing shed & garden. Stone built slated poor. 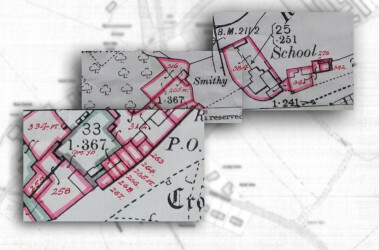 The Smithy appears on the early 19th century maps of the village. Ellen Side House built on site adjacent to the Smithy. 378 – Blennerhasset. Reading Room. Occupier, committee. Owner Sir Wilfrid Lawson, Brayton Hall. 2 rooms, wood dado, fire heated, CH. Stone built slated good. Let @ £1 pa & rates. 312 – Blennerhasset. House & Grocer’s shop. Occupier Jos Blacklock. Owner Jas Thomson. Grocer’s shop, 2 warehouses (1 lofted0 yard CH. Washhouse. 3 hulls & oil store. (1 stall stable & van shed lofted wood, iron roof). Kitchen, 2 pantries, 3 bedrooms. Attic over all. Stone built slated stuccoed fairly good. Let @ £29 & rates including cottage adjoining. Freehold. 313 (included in 312) – Blennerhasset. The Cross Cottage. No details re occupier. Kitchen, pantry, 2 bedrooms, attic. Stone built slated fairly good. Plan 312. FormerVillage Grocer’s Shop (number 312 on map above) and Reading Room (number 378 on map above). Converted to residential post 1913. Glen Lea, modernised and converted from the Reading room. Large garage erected at rear of Shop, post 1960.